Twin City Forty, 1909, 7 x 10 in. bore / stroke. 5 made. Small radiator and fully enclosed cab. *1001 - 1820...40-65 early and type "A" 7 1/4 X 9 bore & stroke. 1821 – 1825….40–65 “B” 7 ¾ x 9, total production, 700 plus units. 5001 – 5478 TD & TF engines 4 ¾ x 7, total production, 478 units. Early model used horizontal TD cross-engine, late model used vertical inline TF engine. 2647 – 2673 …vertical cross-engine, 6 x 8. 2701 – 2797 …vertical inline engine, 6 x 8. 2801 – 3126 …vertical inline engine, 6 ¼ x 8, total production, 626 units. Introduced in 1914 company records as a 60-95 or 60-110 with some confusion. *1001 – 1820 60–90 7 ¼ x 9 six cylinder TE engine. * these tractors fell under the same numbers. Total 60-90 production is unknown. Made for Canadian market. Total production estimate is 100 units. 5501 – 6503 , 5 x 7 ½ , 589 ci. TL engine, 1,003 made. Twin City 12-20, 1918 – 1926 twin cam 16 valve 4 cyl. , 4 ¼ x 6, 340 ci. 10201 – 18733, numbers used to Dec. 4 th 1925. 3201 – 4097 … twin cam 16 valve 4 cyl. 5 ½ x 6 ¾, 641 ci., 897 made. Twin City also entered motor truck production in 1919 with a 2 ton and 3 ½ ton. Total truck production is unknown. These tractors are an FE (21-32) engine in a 17-28 type chassis, however, several castings are different, and have FT #’s on them. Twin City 27-44 1926 – 1935 839 made. Updated , re-rated 20 - 35 , twin cam 16 valve 4cyl. 5 ½ x 6 ¾, 641 ci. 3 speed transmissions were now std. equipment. 4 ½ x 6, 381 ci. LT 1930 4 ¼ x 5, 283 ci. 10 made , all shipped to Argentina. These special order universals used tricycle MT fronts and 12 ½ inch mid-width rear axle housings. 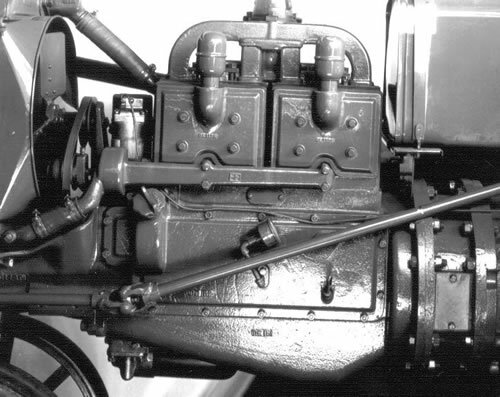 The first 40 1936 MM Z’s appeared in gray paint and used an early version of the 185 ci side valve engine with clutch housing spacer as shown below. Minneapolis Steel & Machinery Co. had a simple and effective way of identifying the cast iron components on the different models of successful tractors they produced during a lengthy 30 year production run. Excluding the heavyweight lineup there were several popular models made from 1918 through 1938. All cast iron TC engine and chassis parts have a two letter prefix in front of the casting numbers. There are many combinations of part numbers following the two letter prefix on castings that can be explained in greater detail in parts manuals. If you memorize the first two letters from various models you can identify a cast iron Twin City tractor part off of an auction rack or a salvage yard parts pile anywhere, anytime and know if it is an engine part or a chassis part. 1918 - 1935 twin cam series including 12-20 & 17-28. Cast iron engine parts numbers for these models begin with TW. Chassis part numbers for baby twin cams begin with TY. 1920 - 1935 big twin cams including 20-35 & 27-44. Engine part number prefix for these models are AE. Chassis part numbers prefix is AT. 1926 - 1938 21-32 engine prefix is FE. Chassis prefix is FT.
1929 - 1938 KT & MT engine prefix is KE. Chassis prefix is KT. KT & MT models used the same 283 ci. engine. There are a few dedicated chassis parts that make the MT different from the KT and will have an MT prefix on them. 1934 - 1937 model J was designed by Minneapolis Moline after the TC-MM merger and used an outsourced Waukesha engine. MM did retain Twin City prefix ideas making the engine JE and the chassis JT.